Wednesday was the feast of the Presentation of Our Lady. 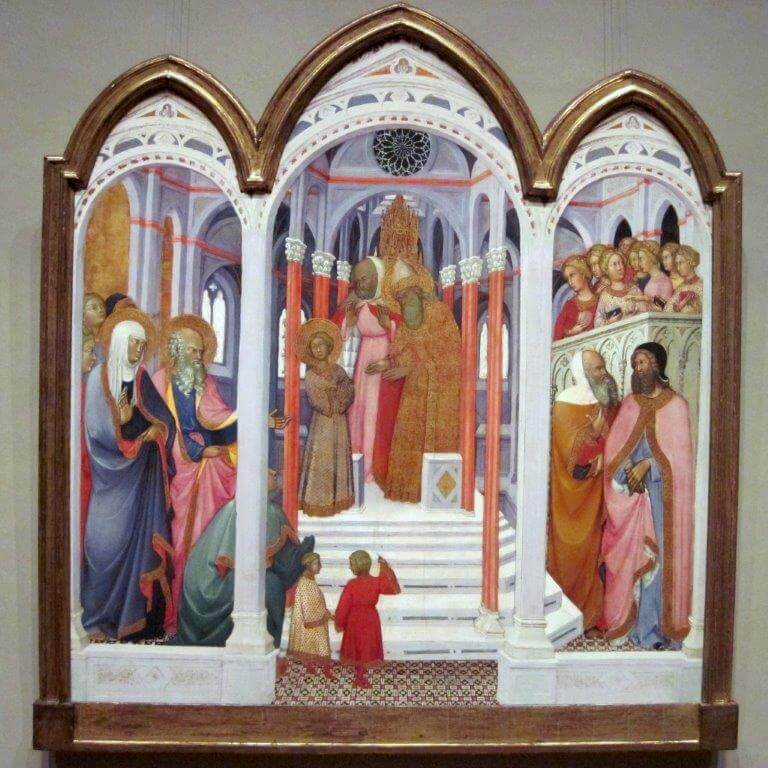 The Presentation of the Virgin was painted by Paolo di Giovanni Fei c.1400 in Siena. It rewards serious inspection. The Blessed Virgin is seen as a child standing on the top step just outside the Holy of Holies in the Temple in Jerusalem. There, before the high priest, she consecrates herself, her perpetual virginity, to Almighty God. To the left of the painting we see her parents, Ss Ann and Joachim, to the right Simeon and S. Joseph. Joachim and Joseph are dressed identically, except the clothes of the virginal Joseph are shown in a slightly paler shade. Younger than Joachim, Joseph is still seen as an older man. Joachim extends his arm towards Joseph as if to pass over the care of his daughter to her would-be husband. Meanwhile, Simeon speaks to Joseph and explains to him the role of perfect guardianship that he is to undertake, in the fulness of time, towards this consecrated virgin child. Being present at this sacred moment explains how S. Joseph, a just man, does not at any point doubt Mary’s fidelity to her vow even when he hears that she is with child by the Holy Spirit (Mt 1:18). He seeks to separate himself from her because the immensity of the task before him is, he considers, beyond him. He believes himself to be unworthy. The archangel Gabriel, in a dream, persuades him otherwise (Mt 1:20-23). Simeon, who visited the Temple so often, and clearly lived nearby, was inspired by the Holy Spirit to go into the Temple on the day that Mary and Joseph presented their child to God forty days after His birth (Lk 2:27). Whilst the Holy Spirit did indeed inspire him to recognize the significance of this child’s birth, nevertheless he recognized Mary and Joseph because he already knew them, and knew also that Mary had taken a vow of virginity to which she would always be faithful. This knowledge, accompanied by the grace of the Holy Spirit, enabled him to see the child as ‘the Christ of the Lord,’ (Lk 2:26), and to sing his hymn, theNunc Dmittis (Lk 2:29-32).